This page is for those of you that are thinking of buying a used Pleo. If you are looking for buying tips and places to buy a new Pleo now then Click Here. For the sake of discussion we will use eBay as a source for used Pleos. There are other notable sources such as Craiglist and others that have Pleo for sale, but eBay is regulated and monitored by eBay and payment is usually done with PayPal, so there are numerous avenues of recourse if you have trouble with a seller or feel you got a defective unit so I�ll use eBay for this discussion. Should I Buy A Used Pleo? While it�s very touching and noble to think about rescuing a lonely Pleo from some owner that has to give it up, the reality is that Pleo, while being a lovable and realistic artificial pet, is also a robot with lots of complex moving parts like servos (motors), gears, and sensitive electronic and computing components. If any of these break your only recourse will be the warranty offered by the seller (if any). If the unit is just plain defective and the eBay seller did not indicate that clearly in the auction page, you can take it up with eBay or PayPal. If they are a power seller which means they will be very concerned about maintiaining their eBay reputaion, then there is perhaps a decent chance of a successful resolution. If not, well then it�s buyer beware. Whatever money you save on a used Pleo for sale, you need to weigh that savings against the current retail price at a vendor like Hammacher Schlemmer. I highlight Hammacher Schlemmer because they offer a free 9 year warranty on a new Pleo. The average 2 or 3 year extended warranty on a new robot or electronic item is about 20% of purchase price so you should add that savings in to your comparison, since Hammacher Schlemmer gives you that 9 year warranty for free. Also, Pleo�s manufacturer Ugobe has special assistance for Pleos that malfunction in the first few months of ownership and this special assistance will most likely be not available to you if you buy a used Pleo (you can check with the seller if you like but I would confirm everything the seller claims with Ugobe customer support directly.) In my opinion, it would have to be a fairly terrific price to justify giving up all these benefits and safety nets to buy a used Pleo. But if you can�t afford a full price Pleo, then that of course outweights all other considerations. (Perhaps you should consider waiting until you can though?). 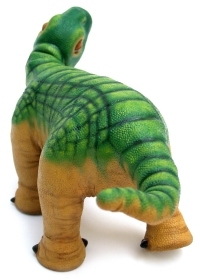 If you still are set on finding a Pleo for sale that is used or from an eBay vendor, Click Here and look below the new Pleo purchase links. You will find a link to eBay for used Pleos for sale and some tips on not getting scammed.